I tend to not step into the baking arena often because I'm not very adept at baking and possess less skills when it comes to fiddling with baking recipes. Occasionally I'll hit upon a recipe for muffins, fruit crisps or quick breads and they work well, no matter how many alterations I may make. My version of a Deceptively Delicious blueberry muffin was an aha moment for me. This recipe was born out of using what ingredients I had on hand and my desire to amp up the fiber, keep the muffins low fat, low sugar and make sure they were flavorful. I scored on all points and I think I've hit upon another go-to muffin recipe. 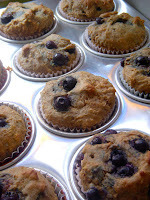 These blueberry muffins are good for you, fairly easy to make, freeze well and best of all, taste great! Preheat oven to 350 degrees. Spray a 12 -cup muffin tin with the cooking spray or line with the cupcake liners; set aside. In another bowl, sift together the dry ingredients - whole wheat and all-purpose flours, wheat germ, baking soda and powders and salt. Whisk to combine the dry ingredients. Slowly incorporated the dry ingredients into the wet ingredients, folding in the dry in 3 batches. Fold the first batch in, then add in 1/4 cup of the blueberries. Fold in the next mixture of flour, adding in more blueberries, but reserving half of what's remaining. Fold in the last of the dry ingredients. Don't over-mix the batter, it should be lumpy. Scoop out the batter using an ice cream scoop and divide among the 12 muffin cups. Top each muffin with remaining blueberries, submerging them slightly but allowing the blueberries to remain almost on top of the muffin batter. Bake for 15 to 20 minutes, until the muffins are slightly browned and a toothpick inserted into the center comes out clean. Cool the muffins for 5 minutes in the muffin tin, then turn them out and cool completely on a wire rack. Makes 1 dozen muffins. These will keep for 3 to 4 days in a covered container in the refrigerator, or freeze for up to 1 month.